Just before midnight, the Arroyo Grande council voted 3-2 for a $22.7 million version of the project, passing on a $12.3 million alternative. Mayor Caryn Ray and Councilman Jimmy Paulding cast the dissenting votes. The project consists of moving the Brisco Road on and off-ramps to West Branch Street and Rodeo Drive, close to the South County Regional Center, where a large roundabout will be constructed. Plans also call for intersection improvements at Grace Lane and Rodeo Drive. 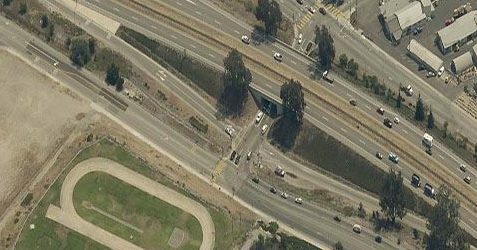 Council members passed on a cheaper alternative that consisted of closing the northbound on and off-ramps at Brisco Road, completing improvements at the intersection of Highway 101 and Camino Mercado, widening the Grand Avenue Bridge, and improving the northbound and southbound ramps at Highway 101 and Grand Avenue. Some business owners argued the cheaper alternative would have impacted the flow of traffic and thus reduced business. Caltrans has allocated $6.6 million for the Brisco Road interchange project, but Arroyo Grande still has insufficient funding to complete the project, City Manager James Begman said. When asked by Mayor Ray how Arroyo Grande would fund the option the council selected Tuesday night, Begman said the project would go to the voters. According to a pervious audit published in CCN: The City is underperforming and under-collecting on building permits at only 33%, per a City audit. 67% seems no to be collected over time. The rate payers have been making up the difference of uncollected funds for non enforcement by the City (CDD) it appears. The CDD Director makes how much salary for passing this deficit along to the rate payers? It has been mentioned that the CDD director does not live in Arroyo Grande. Is that true? Maybe the Director does not know what the rate payers pay living here, if true? The rate payers will be asked to augment for fire and emergency services because the “City has been in the red financially” for some time. The rate payers will be asked to fund the roundabout and all roadwork, which appears to be a fluid number and that number will most likely grow on the most expensive alterative agreed on by the City Council. Where is leadership when you need one! In SLO, the city can only hire contractors who pay a “living wage.” That is code for union only. So the costs skyrocket. Is this the same for AG? The council might as well have voted for the No Project Alternative. Because this alternative will NEVER get built. There is no way the price will hold at $22.7M and there is no way in heck the people of Arroyo Grande are going to tax themselves to cover the cost of this round-about option. The City has immediate needs that also may require increased taxes, i.e. fire service. If a tax is floated, only one will pass…if you had to chose, wouldn’t you vote for emergency services over a glamorous gateway project? It is also obvious that Ray Russom and Paulding are eyeing higher office. Now they both can say in their bids for Supervisor or Assembly that they didn’t vote for Tony’s preferred project. I’m a bit confused by your comment. It says Paulding cast a dissenting vote. That’s right, they both cast dissenting votes…so they can always say they “didn’t support” ripping off the community for the highest price project. Of course, the lower priced project was already known to not fly with Ray, she stated it clearly in her bid for Mayor — wouldn’t want to upset her main man Katcho. Jimmy Paulding voted for the lower cost alternative so while a dissent from the Majorty vote, it was a well reasoned choice that sought to realize the benefits of the $6.6 million allocated from Caltrans and other funds, without creating debt burdens for AG. So I think it’s important to qualify dissent. Who didn’t know Mayor Ray would choose the most expensive option. I knew it and wished I was as sure of the lottery numbers as I was that for Mayor Ray money is no object and she’ll have her name on AG’s first roundabout no matter what it takes. I hope those that voted for her remember this when the city has to cut more staff or costs or raise fees and taxes to pay for this roundabout. Don’t be fooled that she voted against it, she knew she had the other three votes and she hopes this makes her look good when she goes after the supervisor of higher office down the road. Plus she needs a little good PR after her flip flop on the El Campo issue. 11 votes up for someone who cannot read? Mayor Ray, of whom I am not a fan, voted AGAINST this most expensive option, not for it. Jesus! “The project will go to the voters” read the city manager wants Arroyo Grande citizens to approve a tax. However Brisco is used by more citizens than those that live in Arroyo Grande. Is it fair to place the entire $22 million burden on those who pay taxes in the City of Arroyo Grande when this intersection is used by the general public who live throughout the county, throughout the state, and throughout the county? Mitch, according to Kristen Barniech when it comes to the South County, “We’re better together,” (her argument to stay in the Five Cities Fire Authority). So let AG pay to fix Brisco in Beverly Hills style. — After all the roundabout is at Rodeo Drive ya know.